The Oz is the result of a collaboration between Vemuram and virtuoso guitarist Oz Noy. Based on the Shanks 4K, the Oz is modified with 2 vintage Silicon Transistors and N.O.S parts. The Oz has a good amount of gain if needed, but can also sound like a clean fuzzy boost pedal. You can get nice clean tones by turning down the volume of the guitar and still retain the originality of your tone. 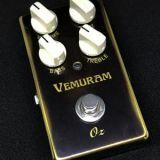 The Vemuram Oz is a limited run of 300 pedals. This is THE BEST Fuzz pedal we have heard , even the legendary fuzz faces . Its just the right amount of fuzz. Dig this nice rundown from Mike McGraw – L.A. Guitarist . He really spent some time with it.